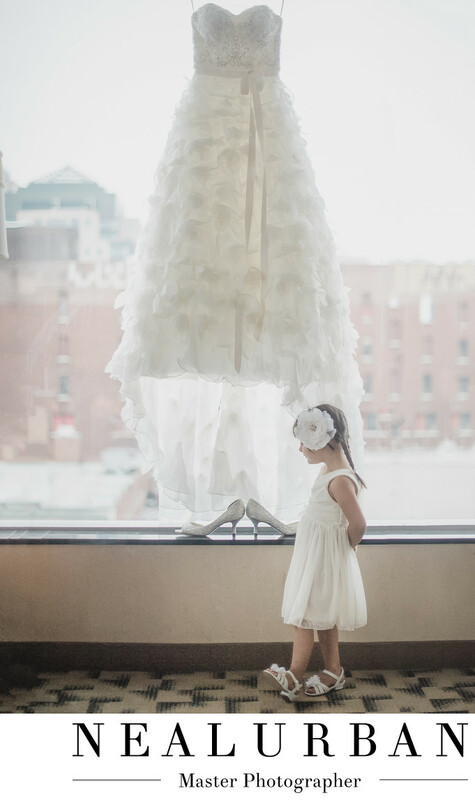 This flower girl was such a curious little girl! For Kelly and Tom's wedding she was at the hotel getting ready with the bridesmaids. They got ready at the Hampton Inn in downtown Buffalo. The wedding was around the corner at the Statler. The ladies were all hanging out having mimosas and getting hair and makeup up finished. We were taking photos of all the details in the other room and out of the way. We hung Kelly's wedding dress with her shoes. We noticed the little flower girl kept sneaking into the room. I told her to come in. She really wanted to see what we were doing. Neal was taking photos and I was showing her the camera and the images taken. Then she decided to walk up to the dress and shoes. We loved how she was standing too. So casual with her hands behind her back. Legs crossed with her foot up! You could tell she wanted to touch the shoes, but wasn't sure if she should. So, she just looked down at them. Mom came in and asked if the flower girl was bothering us. We showed her the image and said not at all! She just made some of the photos even better! The bride had no idea what was going on in the other room either. So it was such a surprise for her to see this image when they got their photos! Kelly and Tom had an amazing family and group of guests. Their dance party was crazy! Everyone had a such a great time! We got so many fantastic images. Not only artistic, but so many candids! Location: 220 Delaware Ave Buffalo, NY 14202 United States.